As soon as we made the decision to produce a phone, we knew that choosing the right production partner was absolutely essential, and no easy task. Not only did we need a manufacturer that was willing to take on our small production runs, we also needed a facility that was willing to collaborate on a completely new way of working including our commitment to transparency. As part of our overall vision, our goal is to improve employee wellbeing and give workers the ability to voice their needs and concerns. Once the order was signed with Guohong* in 2013, we got straight to work establishing the Worker Welfare Fund. With our excitement and optimism, we did not foresee the number of hurdles we would need to overcome to successfully roll out our objectives. Last year, our primary focus was on running the TAOS social assessment program. The report identified a number of long and short-term improvements, and the factory itself has already addressed the basic compliance issues. The long-term structural improvements were used to help define the core objectives of the Worker Welfare Fund. There is no existing model that offers a blueprint for the structure we wanted to set up, so we needed to establish everything from the ground up. We did so with the input from our working group and drew inspiration from the Fairtrade Labelling Organisation. Each step in the process delivers new challenges. Legalising a Dutch foundation comprising Chinese members, for example, isn’t a piece of cake. To accomplish this set up, there was, and still is, a lot of paperwork that needs to go back and forth between countries, Foreign Affairs Offices and Embassies to legalise signatures. A very lengthy and bureaucratic process. But we’re almost there! 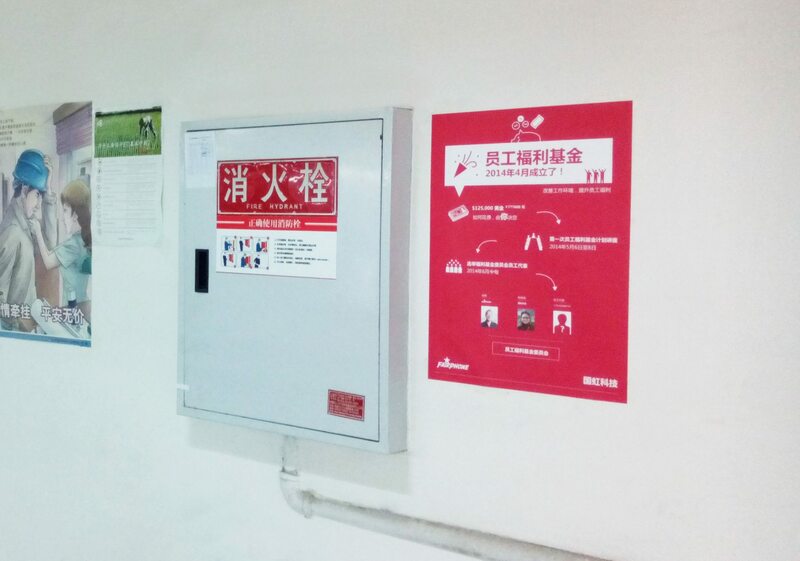 The Worker Welfare Fund is jointly financed by Fairphone and Guohong. For every Fairphone sold, Fairphone and Changhong each agreed to invest $2.50 in the fund. After the sales of the first 25,000 Fairphones, the fund’s initial capital was $125,000 ($5 x 25,000). The Fund will equitably spread the benefits of the premium across Guohong’s entire workforce (not just the Fairphone assembly line). In compliance with the requirements for the social assessment program, it cannot be used for expenditure for which the company is legally obligated, nor may it be used to support the factory’s operational costs. The Worker Welfare Fund will be governed by representatives from the factory workers, factory management and Fairphone. All representatives will have voting rights. 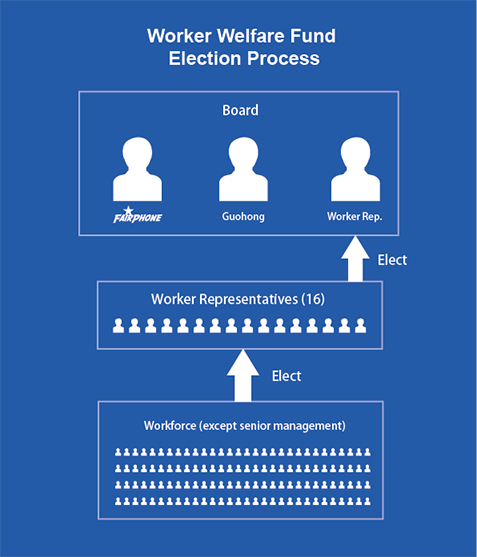 The worker representatives will be elected by the workforce, excluding senior management. Management representatives will be appointed by Guohong’s management. The representatives will be jointly responsible for managing, investing and spending the Worker Welfare Fund on behalf of the workforce. The fund will operate transparently, meaning that all the workers have the right to see how decisions are made and how money is spent. A detailed description of various worker and management representative roles and responsibilities, as well as insight into the selection process, will be provided in a future blog post. Improved factory facilities (TV/radios for break rooms, better equipment, etc. The worker representatives will define their own guidelines for selecting projects, including: the number and types of workers it will benefit, whether the project will have a lasting impact, and whether it provides something that was not previously available. Each quarter, all of the worker representatives will vote on the suggested spending proposals to narrow it down to a maximum of three options to present to the board. The board is made up of three members: one appointed by Fairphone, one appointed by Guohong and one which is elected by the employees (names will be announced in a future blog post). During the review session, the board will approve one proposal. While it has taken some time to set up the first activities for workers, the trainings have been enthusiastically embraced by Guohong’s employees. At the beginning of May, Fairphone and an external partner completed the first training with workers to provide them with a proper introduction to the workings of the Fund and to prepare them for the process of electing worker representatives. Nominations of representatives starts in June. Once the nominees are known (workers can nominate themselves), the workers will vote to elect the 16 representatives. After the representative elections are complete, the fund can start moving forward with the project selection process. It is expected that the first projects will be presented to the board this summer, and the project chosen for funding will be implemented in the weeks after. For the sales of the 2nd batch of Fairphones, Guohong has once again agreed to match Fairphone’s $2.50 contribution for every Fairphone sold. With a production run of 35,000 phones, this means that the fund has the potential to grow by $175,000 by the end of this year. *Previously, we have referred to our production partner as Changhong. Our legal contracts (both manufacture and Worker Welfare Fund) are with the factory, Guohong, which is why we have chosen to use Guohong in all our communications going forward.